Hitler lost the April 1932 Presidential election to Hindenburg, but the National Socialists won a large plurality of seats in the Reichstag in the July and November elections. After much political wrangling, Hitler was appointed Chancellor in January 1933. 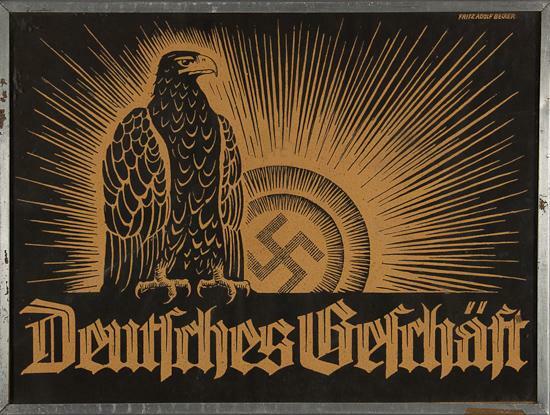 Some were still afraid that the Nazis would soon succumb to Jewish influence. Hitler and Goebbels are clearly visible on two of the chess pieces at right, saluting the Jews on the other side of the board. In fact, once in power, the Nazis immediately arrested their political opponents and then transformed Germany’s legal code, foreign policy, political and civil institutions including even the grade-school curriculum, as per their 1920 Partei Programm. They also wasted no time in moving against the Jews. These flyers announce a boycott of Jewish shops and professionals beginning 1 April 1933, just two months after Hitler became Chancellor. It was the first official government act against German Jewry and marks the beginning of the end for the Jews of Europe. Your power has ended! Your time is up! Today at 10am begins the German boycott, as a defensive measure against the atrocity propaganda of international Jewry. It is at the same time the liberation of the German economy from century-old systematic negligence and enslavement! No German will buy from Jews anymore! Boycott all newspapers that sell advertising to Jews! On the night of 10 May 1933, books deemed ‘un-German’ in spirit, including all those written by Jews, were removed from university libraries and ceremoniously burned in great bonfires, accompanied by speeches and other festivities organized by the National Student Union. A comprehensive List of Harmful and Undesirable Literature was published in 1938. 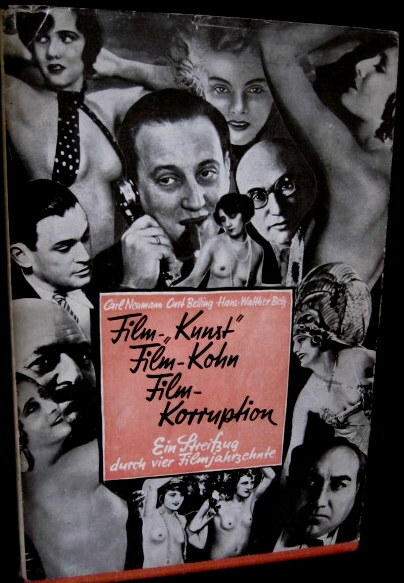 Blacklists of Jews in the visual and performing arts were also compiled: Lexikon der Juden in der Musik (1940) is an annotated index of every known Jewish musician, living or dead; Judenkunst in Deutschland (1942) lists Jewish artists, dealers, galleries, and venues where modern art was shown. A lexicon of Jews in theater and film was in preparation in 1943 but never completed. Leni Riefenstahl’s groundbreaking documentaries of the Party’s Nuremberg rallies of 1933 & 1934 made clear the power of motion pictures as propaganda vehicles, and Goebbels soon directed the German movie industry to begin producing antisemitic films. In 1939 an antisemitic musical comedy, “Robert und Bertram”, was released, followed in 1940 by “The Rothschilds”, “Jud Süss”, and what must surely be the most despicable movie ever made, “The Eternal Jew”. After Hindenburg’s death in 1934, a national plebiscite was held on whether Hitler should also assume the Presidency. In effect, it was a referendum on the first 18 months of National Socialism. It passed by a wide margin. Yes! Führer we will follow you!